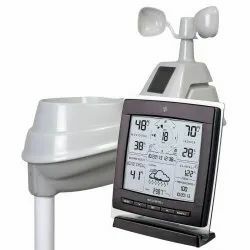 Pioneers in the industry, we offer rain sensor weather station, wind vane weather station, relative humidity weather station, weather station anemometer and wind vane from India. With the help of our experienced team members, we have been able to manufacture and supply a qualitative range of Rain Sensor Weather Station. Robustly constructed these devices are extensively acclaimed for their precision measurements, robust construction and longer functional life. Besides, these need very less maintenance and care and provide accurate weather data in a sophisticated yet easy-to-read format. It uses a tipping bucket mechanism to produce a contact closure every time it receives a predetermined quantity of rainfall. The body and funnel are made of FRP (Fiber glass Reinforced Plastic), rim is made of gun metal. All parts having contact with water are made of stainless steel. Each tip of the bucket produces an on-off output when the magnet passes over the reed switch. 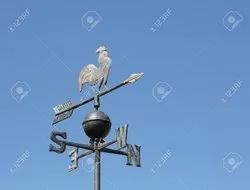 We are engaged in offering our prestigious clients a very highly premium and excellent quality range of Wind Vane Weather Station. We provide the complete Wind Vane Weather Station for meteorological and environmental monitoring. Our range is available at market's most leading prices. Wind Vane Weather Station is a counter balanced, low threshold wind vane. A Linear, wire wound endless potentiometer is coupled to the vane by an SS shaft. As the vane turns, it rotates a stainless steel shaft which is coupled to the potentiometer. This potentiometer has excellent linearity, very low starting torque. The north of the Wind Vane Weather Station is marked on its body. This line is to be aligned with actual North with the help of prismatic compass, at the time of installation. We are involved in manufacturing and supplying a wide range of Relative Humidity Weather Station. Precisely engineered our devices are widely recommended by clients owing to its accurate measurement, sturdiness and durability. These are precisely engineered following international industrial standards and available in various dimensions and range as per the exact requirements of clients. one can avail these at reasonable rates. Relative Humidity Weather Station features an improved design to provide highly accurate and rapid measurements. The Relative Humidity Weather Station is a thin film capacitor element. A dielectric polymer absorbs water molecules from the air through a thin metal electrode and this causes a capacitance change proportional to humidity. The response is essentially linear. A sintered filter is provided to protect the sensor element from dirt, atmospheric pollutant and water condensation. A solid state electronic circuit is built in each probe to produce 0 to 1000 M. Volts output signal corresponding to relative humidity value 0 to 100%. The output is single ended. 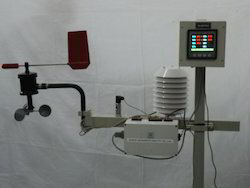 We specialize in manufacturing a wide range of Weather Station Anemometer. These are engineered under the firm direction of expert quality controllers and widely acclaimed for their highly accurate measurements, sturdy construction and effective usage. these devices consumes very less power and ensure longer functional life and consistent performance. Our Weather Stations Anemometer are available with us in various range and models. 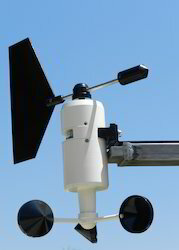 Weather Station Anemometer is a fast response, low threshold op to electronic anemometer. When rotated by wind, a chopper on the anemometer shaft Interrupts an infra red light source , generating pulses from a photo transistor. The signal is amplified and fed through a line driver. The frequency is proportional to wind speed. The anemometer is provided with a 3 pin connector for easy replacement and comes with 10 meters of shielded cable.For operation at low temperature the sensor can be supplied with a built in heater The Anemometer can be supplied with a 20W 24 V DC built in heater for operation at low temperatures. We are engaged in offering our prestigious clients a very highly premium quality range of Wind Vane. Our range is known for its highly excellent quality and durability. Our range is available at market's most leading prices. Wind Vane is a counter balanced, low threshold wind vane. A linear, wire wound endless potentiometer is coupled to the vane by an SS shaft. As the vane turns, it rotates a stainless steel shaft which is coupled to the potentiometer. This potentiometer has excellent linearity, very low starting torque. The north of the Wind Vane is marked on its body. This line is to be aligned with actual North with the help of prismatic compass, at the time of installation. Sensor gives minimum resistance at North (i.e., 0 degree approximately 20 ohms). The resistance output linearly proportional to the position of the Wind Vane. 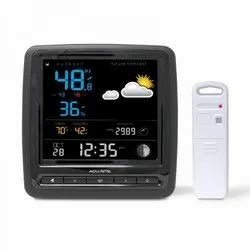 Looking for Weather Station ?